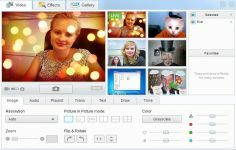 Brighten up video chats through the addition of special effects in real time with this great application called Manycam. Manycam is a tool for managing a webcam that is usable on multiple. It allows to enhance the video broadcast from the webcam. 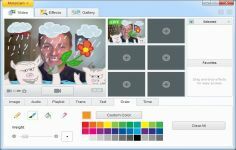 In fact, when the webcam is used in a private chat or even a discussion group, user can add animated pictures, small visual effects, background colors, text or date and time in the box visual. User can order different animations directly from his communications software. ManyCam offers a wide range of effects from the simplest to the most complicated. The "object" tab allows superimposing an Avatar mask, and movable objects with a single click. The mobile or fixed set background (sky, sunset, waterfall) "background" option attached to the image. The "Effects" allows distorted images, changing colors, applying distorting lenses, or other flames and snow effects. The application also allows to change the eyebrows, eyes, hair, faces and hats. All adapting in real time according to the position and movements of the face. This tool is compatible with the software of the most popular communication such as Skype, Windows Live Messenger or Yahoo Messenger.